Dynamics CRM 2015 will be available soon but many customers are still using successfully CRM 4.0 (released in 2007) or CRM 2011 (nearly 4 years old) for their business processes. On the other hand we have Operating Systems and browsers updated regularly due to security reasons or machine upgrades. Dynamics CRM has been always compatible with Internet Explorer but not with all the versions, we can't expect to use Internet Explorer 6 with the latest version or pretend to use IE11 with CRM 4.0. As developer I faced this issue when I upgraded my PC to Windows 8 and Internet Explorer 11, I wasn't able anymore to use a CRM 2011 instance, the mobile version was prompted to me. 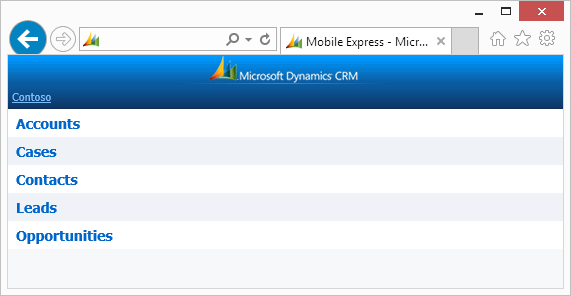 CRM 2011 is compatible with Internet Explorer 11, but it must have Rollup 17 installed, and that wasn't the case. Based on this data Internet Explorer 7 is the best candidate for CRM 4.0 and CRM 2011. We can rely on a Virtual Machine in order to use a previous Internet Explorer version without messing up our current environment. Creating a VM is a tedious process and it can take several hours. Lucky for us Microsoft provides a set of Internet Explorer VMs ready to be downloaded. They are available at modern.IE, the intended use is to test a website compatibility with old browsers but they are also good to access occasionally to Dynamics CRM. I wrote occasionally because these VMs are not meant for a production use and the Windows version included is a trial. If it's necessary to use constantly an older browser (or you have a Mac) it's better to build a proper VM with the right licenses. Personally I use VirtualBox (you need to disable Hyper-V in Windows 8 to get better performances) but the VMs are available also for Hyper-V, VMWare, Virtual PC and Parallels.